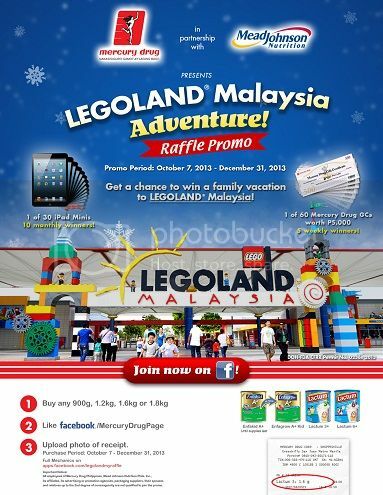 Join Legoland Malaysia Adventure Raffle Promo! Do you want to win a trip to Legoland Malaysia? Well, you can make that dream come true by joining the Legoland Malaysia Adventure Raffle Promo. Mercury Drug Corporation partners with Mead Johnson Nutrition Philippines to give you and your family a chance to win that well-deserved, dream vacation to Legoland Malaysia! 1. Buy any Enfakid A+, Enfagrow A+ Kid or Lactum 3+/6+ from Mercury Drug branches nationwide from October 1 to December 31, 2013. *Participating products: 900g, 1.2kg, 1.6kg and 1.8kg. 3. Register. Just fill in the required fields and click “Submit.” You only need to register once during the promo period. •	Upload a photo of your Mercury Drug receipt with an Enfakid A+, Enfagrow A+ Kid or Lactum 3+/6+ product. •	Key in the details of your proof of purchase. •	Wait for your receipt to be validated within 48 hours. 6. Upload as many receipts for more chances of winning. Winners will be selected via electronic raffle. There will be 60 weekly winners of Mercury Drug Gift Certificates (5 winners weekly), 30 monthly winners of iPad Minis (10 winners monthly), and ONE GRAND WINNER of a Legoland Malaysia family vacation for 4 to be drawn on January 08, 2014. Submission of entries will be from October 07, 2013 to December 31, 2013. To join the raffle promo, visit: apps.facebook.com/legolandmyraffle. This entry was posted in Enfagrow A+ Kid, Enfakid A+, Lactum 3+, Lactum 6+, Legoland Malaysia Adventure Raffle Promo, Mead Johnson Nutrition Philippines, Mercury Drug Corporation. Bookmark the permalink. One Response to Join Legoland Malaysia Adventure Raffle Promo!